Chicago Mayor Rahm Emanuel said the city plans to send a bill to "Empire" actor Jussie Smollett for the cost of the investigation into his report of an alleged hate crime attack earlier this year. A city official says Chicago is seeking $130,000 from "Empire" actor Jussie Smollett to cover the costs of the investigation into his reported beating, which police say was staged. Bill McCaffrey, a spokesman for the city government's legal department, confirmed the amount Thursday, hours after Mayor Rahm Emanuel said the city would try to recoup the money it spent on the investigation. Chicago Mayor Rahm Emanuel, who has bashed prosecutors' decision to drop charges against Smollett in exchange for community service and his $10,000 bond, told reporters Thursday he expects to ask Smollett and his legal team to write a check. "The police are assembling the cost [of the investigation]," Emanuel said. "They'll do that and then the corporation counsel of the city of Chicago will communicate to Jussie Smollett and his legal team about recouping that cost in that effort. And, given that he doesn't feel any sense of contrition and remorse, my recommendation is when he writes the check, in the memo section he can put the word, 'I'm accountable' for the hoax." "The finance is a piece of it and an acknowledgement that what he did at every level was wrong," he added. A representative for Smollett's legal team said "it is the mayor and the police chief who owe Jussie - owe him an apology - for dragging an innocent man’s character through the mud. Jussie has paid enough." Emanuel also clapped back at President Donald Trump, who tweeted earlier Thursday that the case "is an embarrassment to our Nation!" "My recommendation to the president is go to Opening Day baseball. Sit on the sideline," he said. "Stay out of this." "[Trump] created an environment that people think, like - I'm not done, I'm just getting started - that Jussie Smollett thinks that that hate-filled environment that the president created, pinning one American against another because of their background, then creates an environment he thought he could take an advantage of and create a hoax around a hate crime," he added. "It is a vicious, toxic environment and cycle. I want to break it." Smollett's attorney said Thursday the actor simply wants to "move on," claiming the aftermath of the alleged beating was "much harsher" than the attack itself. "What that attack was pales in comparison to the attack on him by the mayor, by the CPD, by the press, by the public," one of Smollett's lawyers, Tina Glandian said in an appearance on TODAY. 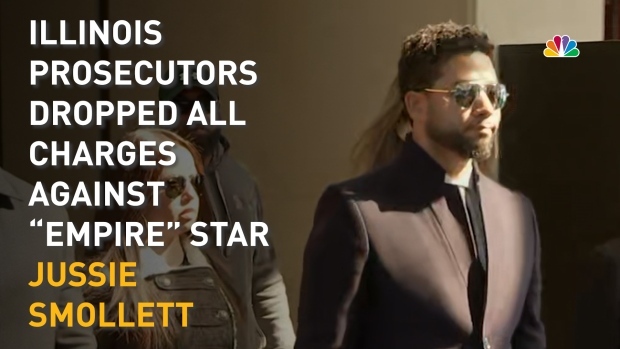 In an appearance on TODAY Thursday, Smollett attorney Glandian said his legal team was "not at all" concerned about a potential FBI investigation into the circumstances surrounding the dismissal of charges. Emanuel and Chicago Police Supt. Eddie Johnson hammered the decision to dismiss charges against him, saying they were unaware it was happening.